Mayr, G. (1866) Diagnosen neuer und wenig gekannter Formiciden. Verhandlungen der k. k. Zoologisch-Botanischen Gesellschaft in Wien 16: 885-908. Total length of workers around 2.5 mm. Body color brown to reddish brown; legs yellowish; gaster blackish brown. Head rounded, posterolateral corners not angulate in full face view; posterior margin straight. Eyes prominent. Clypeus with a median carina; anterior margin with 7 blunt teeth. Mandibles each with 2 large apical and 2 smaller basal teeth. Antennal scapes long, exceeding posterior margin of head in full face view. Mesosoma relatively short. Pronotal dorsum straight in profile; anterior border marginate in dorsal view. Dorsa of mesonotum and propodeum almost straight in profile. Propodeal spines long and acute, exceeding the posterior extensions of the propodeum, and reaching the midlength of the petiole. Petiolar node subtriangular in profile; subpetiolar process absent. Sculpture of head and mesosoma strongly reticulate, gaster smooth, subopaque. This species is queenless. The workers produce further workers by thelytoky (Mizutani, 1980, 1984; Itow et al., 1984). Functionally, two classes of workers are present in colonies: extranidal workers, which forage outside the nest, and intranidal workers, which stay within. The intranidal workers are the reproductives and lay eggs. Younger workers are intranidal, older ones extranidal (Mizutani, 1980, 1984; Tsuji, 1988, 1988a, 1990a). In some cases colonies may have many ergatoid females. These have relatively large heads and ocelli (Itow et al., 1984). Males are rarely produced, if so they are found in summer. A large colony of this species can comprise several tens of thousands to several hundred thousand workers. P. pungens does not establish permanent nests, but relocates its colonies frequently (Mizutani, 1982, 1984; Tsuji, 1988b). Long lines of migrating ants are often formed. Ecological and ethological studies have been carried out by Morisita (1939), Tsuji & Ito (1986) and Tsuji (1990b). Forel (1900) described Pristomyrmex japonicus from Japanese material, but Viehmeyer (1922) later synonymized japonicus with P. pungens. The species is widely distributed in Southeast Asia. 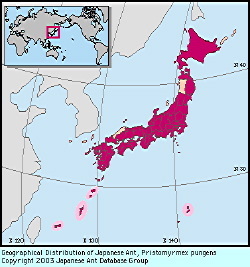 P. pungens is commonly found in Japan, but is less common and sometimes rare in other areas. Hokkaido (southern part), Honshu, Shikoku, Kyushu, Tsushima I., Nansei Is; Mainland China, Korea, Taiwan, E India to Malacca and Borneo. Mizutani, A. (1980). Preliminary report on worker oviposition in the ant Pristomyrmex pungens Mayr. . Kontyu , 48, 327-332. Mizutani, A. (1984). Colony organization in the ant Pristomyrmex pungens. . , 74. Itow, T., K. Kobayashi, M. Kubota, K. Ogata, H. T. Imai & R. H. Crozier (1984). The reproductive cycle of the queenless ant Pristomyrmex pungens. . Ins. Soc., 31, 87-102. Tsuji, K. (1988). An unusual life history in the queenless ant, Pristomyrmex pungens. . Insectarium, 25, 312-318. .
Tsuji, K. (1988a. ). Obligate parthenogenesis and reproductive division of labor in the Japanese ant Pristomyrmex pungens: comparison of intranidal and extranidal workers. . Behav. Ecol. Sociobiol., 23, 247- 255. Tsuji, K. (1990a. ). Reproductive division of labour related to age in the Japanese queenless ant, Pristomyrmex pungens. . Anim. Behav., 39, 843-849. Mizutani, A. (1982). Some observations of the relationship among nest of the myrmicine ant Pristomyrmex pungens. . Kontyu , 50, 390-395. Tsuji, K. (1988b. ). Inter-colonial incompatibility and aggressive interactions in Pristomyrmex pungens (Hymenoptera: Formicidae). . J. Ethol., 6, 77-81. Morisita, M. (1939). Interactions of several species of ants on a tree. . Kansai Ent. Soc. , 9(2), 22-42. Tsuji, K. & Y. Ito (1986). Territoriality in a queenless ant, Pristomyrmex pungens (Hymenoptera: Formicidae). . Appl. Ent. Zool., 21, 377-381. Original text by Mamoru Terayama, Keiichi Onoyama and Masao Kubota. English translation by Mamoru Terayama, edited by Robert W. Taylor.